Double Decker - Echinacea purpurea - Perennial. 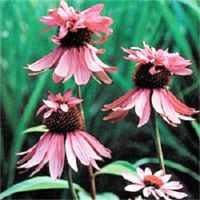 An unusual variety resembling a standard rose pink coneflower wearing a hat. The cone is crowned with a secondary smaller set of petals. Height: 40in. 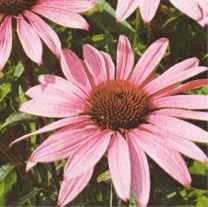 Little Giant - Echinacea purpurea - Perennial. Large recurved blooms are a deep red-pink and are arranged in a double row around a central bronze colored cone. A great dwarf variety. Height: 24in. Purple coneflower - Echinacea purpurea - Drought tolerant plants with large daisy like purple blooms that throw their petals back from the center cone. Very pretty in mass plantings. Prefers well drained rich soil, but is extremely tolerant of soil types. Sow in spring or fall. Height: 36in. Sunset - Echincea 'Sunset' - Perennial. Something completely different in coneflowers! Bright orange petals surround a brown central cone. Petals overlap and bend slightly backward. Wonderful fragrance reminds one of a rose. Excellent choice for the perennial bed. Vigorous and productive. Height: 30in. 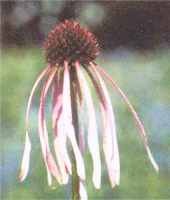 Tennessee Coneflower - Echinacea tennesseensis - Perennial - Medicinal- This variety was declared an endangered species in 1979 and survives in only 5 wild populations in central Tennessee. 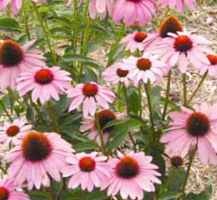 The soft furry leaves are accompanied by slightly upturned petals, differing it from the common Echinacea. Roots have been used to treat upset stomach and treat infections, and more recently to lower blood cholesterol. Full sun; plant height: 24-36in. White Swan - Echinacea purpurea - Perennial - White petals with an orange/brown centers. Full sun; plant height: 36in. Yellow - Echinacea paradoxa - Perennial - Yellow 3-inch blooms with a mahogany center. Native of Missouri and Arkansas. Full sun; plant height: 30 in.